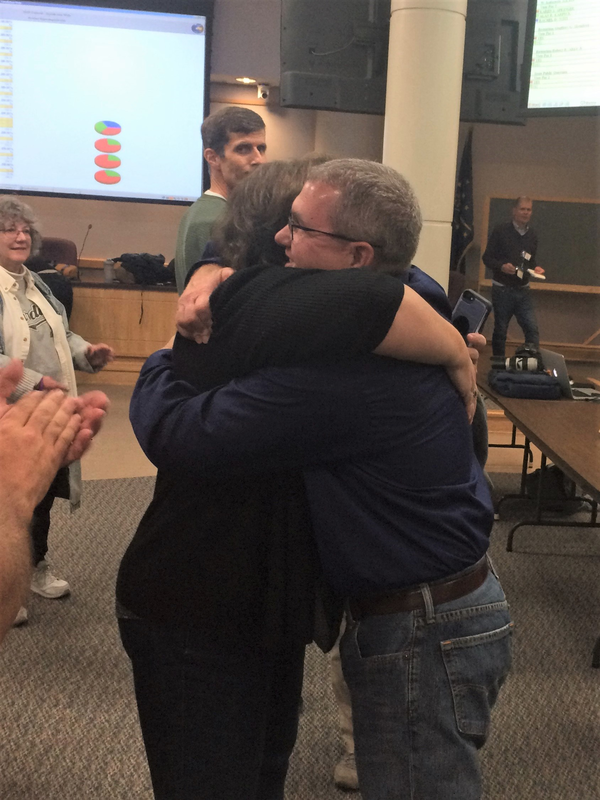 Bob Goldsmith hugs a supporter after winning the Tippecanoe County Sheriff's race. Longtime sheriff’s department employee Bob Goldsmith shocked many by defeating West Lafayette Police Chief Jason Dombkowski in Tuesday’s Tippecanoe County Sheriff’s race. Goldsmith, a Democrat, entered the race after the May primary, and faced an uphill battle against Dombkowski’s significant name recognition advantage and backing from the county’s Republican establishment. Had Goldsmith lost, he’d have had to work for the man who beat him in the race. Now, he says he hopes to join forces with Dombkowski, who will go back to being police chief. Goldsmith won the race by a margin of fewer than 300 votes, out of more than 50,000 cast. Goldsmith is a first-time elected official, who’ll also have to work to regain respect for an office that Dombkowski and another Republican routinely bashed in the May primary, mostly because of perceptions that outgoing Sheriff Barry Richard wasn’t committed enough to the job.